The Tamron 70-300mm f/4-5.6 Di VC USD Lens features a popular and useful focal length range, a nice design, USD (Ultrasonic Silent Drive) AF and VC (Vibration Compensation) for a very affordable price. Riding above the typical 18-55mm focal length range found in kit and general purpose lenses, the 70-300mm (or similar) focal length range is extremely popular - easily covering the range I typically recommend to someone interested in a second lens. Note: I don't consider the gap between 55mm and 70mm to be significant. Here is an example of what the 70-300mm focal length range looks like on a full frame DSLR (a Canon EOS-1Ds Mark III was used for these samples). With an effective angle of view similar to a 112-480mm lens on a full frame DSLR, APS-C sensor format DSLRs will frame the scene even tighter with the Tamron 70-300 VC mounted. Either way, the difference between 70mm and 300mm is very obvious. And the overall range is very useful. Generating a list of uses for a 70-300mm lens is a daunting task (it includes family life, vacations, landscapes, travel, wildlife), but the relatively narrow aperture typically found in this class of lens removes low light action from its uses list. 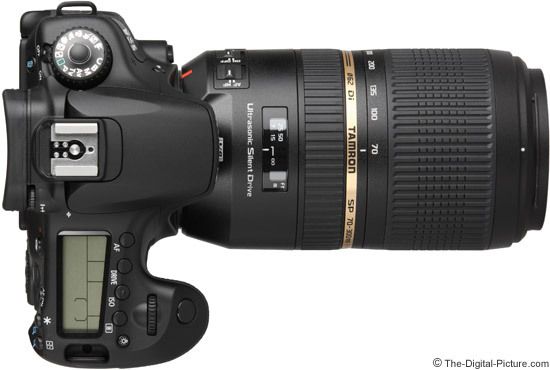 Also typical for a lens of this class is that the Tamron 70-300mm f/4-5.6 Di VC USD Lens has a variable max aperture. At 70mm, f/4 is available, but at 300mm, f/5.6 is the widest aperture available - a 1 stop difference - allowing 1/2 as much light to reach the sensor. Here is a comparison of the aperture step down between the Tamron and some Canon telephoto lens models. Aside from being narrow at the long end, the 70-300's variable max aperture means that manual exposures utilizing a wide open aperture will not stay consistent over the focal length range. Again, this attribute is shared by all lenses in this class. The Tamron 70-300mm f/4-5.6 Di VC USD Lens features Tamron's Vibration Compensation technology (the VC in the name), promising 4-stops of camera shake assistance. The VC on this lens causes the image in the viewfinder to jump when it activates. An easily audible (though not loud) click is heard when the stabilization initiates and again when it terminates. A quiet whirring can be heard while stabilization is active. In good test conditions (concrete floor, indoors), I am getting a reasonable 70mm keeper rate at shutter speeds as slow as 1/10 and a not-too-bad rate at 1/8. This is about 2-2/3 stops of assistance realized. At 300mm, I am getting a strong keeper rate with shutter speeds as slow as 1/25 and still reasonable rates at 1/20 - which is about 4 stops of assistance. As usual, a low percentage of sharp images can be captured at even longer exposure durations - as low as 1/10 at 300mm. I find image stabilization to be incredibly useful. Besides allowing sharp handheld shots to be captured at shutter speeds longer than needed without stabilization, image stabilization makes perfect framing much easier. Especially at 300mm, a motionless viewfinder is extremely helpful in this regard. For its low price, the Tamron 70-300mm f/4-5.6 Di VC USD Lens delivers rather impressive overall image quality. At 70mm with a wide open aperture, the 70-300 VC has decent sharpness right into full frame corners (the bottom corners show slight softness) and shows little improvement when stopped down (narrower aperture). Center of the lens image quality slowly degrades through 200mm - remaining usable. Stopping down provides only slight improvement in center of the lens sharpness. Corner performance worsens by 100mm but then holds through 200mm - remaining reasonable. Again, stopping down provides only slight improvement in sharpness. By 300mm, this lens delivers poor image quality across the frame (except on the far left side of the frame). Stopping down at 300mm helps, but even f/11 image quality is only marginal. If you consider this a 70-200mm lens, you will be more happy than if you are counting on getting great 300mm image quality. Full frame sensor format DSLR users should expect to see between 1.5 and just over 2 stops of vignetting in the corners. This will be noticeable in certain shots - such as when an evenly-blue sky is in the corner of a frame. APS-C (1.6x FOVCF) body users will not likely notice any vignetting except perhaps in the 300mm corners. As usual, a narrower aperture resolves any vignetting issues. CA is very well controlled in the Tamron 70-300 VC, with only a small amount of CA apparent in full frame corners. Slightly more CA is visible in the left side of the frame than the right. The 70-300 VC will show some flare if a bright light is in the frame, but the amount of flare is not unusual. Slight barrel distortion at 70mm quickly changes to modest pincushion distortion at 100mm. Pincushion distortion increases over the focal length range until becoming moderately strong at 300mm. The bokeh (quality of background blur) delivered from the Tamron 70-300mm f/4-5.6 Di VC USD Lens' 9 aperture blades is not the best. Even though this lens does not have a wide aperture, the relatively long 300mm focal length is still able to create a nice amount of background blur with a relatively close subject. 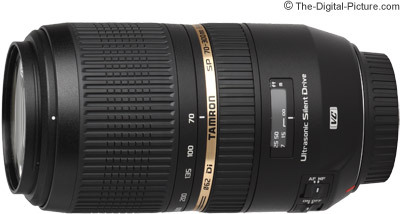 The Tamron 70-300mm f/4-5.6 Di VC USD Lens incorporates Tamron's first implementation of "USD" or Ultrasonic Silent Drive. My first thought is that the words Ultrasonic and Silent are redundant as far as humans are concerned, but ... the lens does focus quietly (though not completely "silent"). The 70-300 VC's focus speed is not especially fast. Combining a somewhat slow AF speed with a relatively narrow aperture means that this lens is not the best choice for sports photography. The Tamron 70-300 VC will work best in this regard when shooting a subject that remains a near-constant distance from the camera under a healthy level of daylight. Much more problematic is the inconsistent focus accuracy I'm experiencing from the Tamron 70-300 VC. I had to spend a more-than-usual amount of time focus testing this lens - just to confirm what I was seeing. And my determination is that my Tamron 70-300mm f/4-5.6 Di VC Lens (purchased retail) is very inconsistent in the focus accuracy department. I have used the 70-300 VC on multiple Canon EOS-1Ds Mark III bodies and on a Canon EOS 60D with similar results. Some shots are focused accurately while backfocusing occurs as frequently as frontfocusing. With their deeper DOF (Depth of Field) with identical framing, APS-C camera bodies will not show the focus errors as readily as full frame bodies. The bottom line is that even a sharp lens does not deliver sharp subjects if not focused accurately. Focus accuracy issues were realized in the field - and they made evaluating VC difficult as I had to discern whether the cause of blurred shots was mis-focusing or camera shake. The Tamron 70-300mm f/4-5.6 Di VC USD Lens focuses internally and has FTM - manual focus is always available and the focus ring does not turn during autofocus. Filters attached to this lens will not rotate with focus changes. The focus ring is very nice - smooth, no play and a nice amount of rotation (160°). Focus breathing (image changes size when focusing) is noticeable at the wide end, but far less apparent to me at 300mm. The mechanics of the focus system appear to be of good quality. The Tamron 70-300 VC's minimum focusing distance is very reasonable for a telephoto zoom lens and the resulting about-as-good-as-it-gets maximum magnification of .25x reflects this. Extension tubes will increase the maximum magnification somewhat. The 70-300 VC is not compatible with extenders. 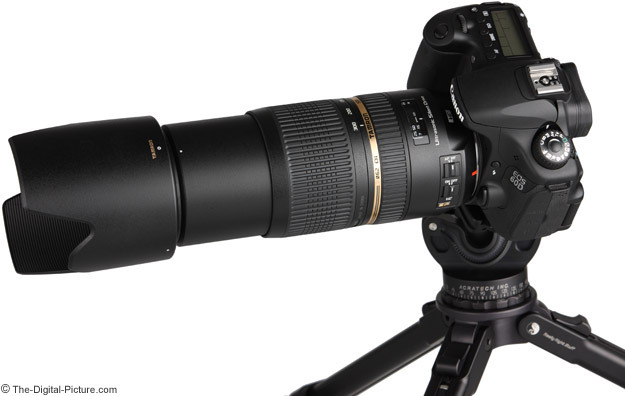 The Tamron 70-300mm f/4-5.6 Di VC USD Lens has an attractive, smooth profile, design. Nicely sized and ribbed focus and zoom ring appear tightly integrated with the plastic lens barrel. Like the rest of the lenses in its class, the 70-300 VC extends significantly when zoomed to 300mm. The single-piece lens extension feels solid with little wobble even at 300mm. The Tamron 70-300 VC zooms in the Nikon direction - opposite that of Canon lenses. The focus and zoom rings are smooth with very little play. My preference is for a front-positioned focus ring, but there is adequate room for handling is provided behind the Tamron 70-300mm f/4-5.6 Di VC USD Lens focus ring. The Tamron 70-300mm f/4-5.6 Di VC USD Lens has only two switches. One for turning VC on/off and one for selecting manual/autofocus. The switch surrounds are flush with the lens body and the switches themselves are raised slightly. Very little effort required to move the switches - I would prefer them to be more resistant to accidental changes. The included Tamron 70-300 VC hood is relatively long and narrow. When reversed, the lens hood fits onto the lens very compactly - but covers the entire zoom ring. This means that using this lens with the lens hood reversed eliminates the zoom feature. I actually view this as a positive attribute as it forces proper use of hood (I see hoods used in reverse position FAR too often). Tamron's excellent center-and-side pinch lens cap is easy to remove even inside the long hood. A case is not included with this lens. The Tamron 70-300mm f/4-5.6 Di VC USD Lens is not a small or light lens, but it is average for its class. Here is a look at the Tamron size and weight compared to many Canon alternatives. For many more comparisons, review the complete Tamron 70-300mm f/4-5.6 Di VC USD Lens Lens Specifications using the site tool. If you are a Canon EOS DSLR owner, you likely took notice of the unusual 62mm filter size. The Tamron 18-200mm f/3.5-6.3 XR Di II Lens and the Sigma 30mm f/1.4 EX DC HSM Lens are the only non-Nikon lenses in my specification database at review time that share this filter size. There are seven Nikon lenses with a 62mm filter size in my database, but Canon owners may be buying a set of filters specifically for this lens - a cost that must be considered. Fortunately, smaller-sized filters are relatively affordable. 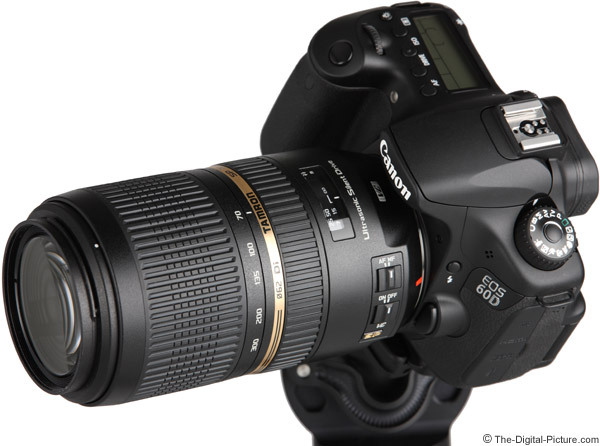 The Canon lens most comparable to the Tamron 70-300mm f/4-5.6 Di VC USD Lens is the Canon EF 70-300mm f/4-5.6 IS USM Lens. The Canon's advantages include modestly lighter weight, better AF accuracy, less vignetting and less pincushion distortion through 200mm. The Tamron's advantages start with a much better price (with the lens hood included). The Tamron's AF system is nicer with internal-focusing, FTM and no filter rotation during AF. The Tamron has modestly less flare, less barrel distortion at 70mm and modestly less pincushion distortion at 300mm. If you need great 300mm image quality from a 70-300mm lens, the Canon EF 70-300mm f/4-5.6 IS L USM Lens is the answer. As you would expect, this huge improvement in image quality, along with better build quality and much better autofocus performance, comes at a price. 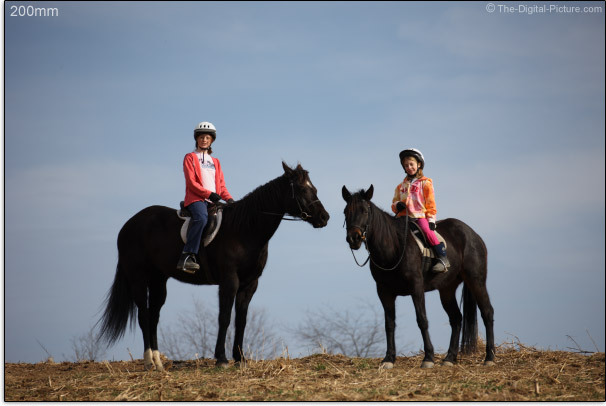 The difference in image quality between the 70-300 L and the Tamron 70-300 VC is readily apparent in the results. The Tamron 70-300mm f/4-5.6 Di VC USD Lens is available in Canon (reviewed), Nikon and Sony/Minolta mounts. My standard disclaimer: There are some potential issues with third party lenses. Since Tamron reverse engineers (vs. licenses) manufacturer AF routines, there is always the possibility that a DSLR body might not support a (likely older) third party lens. Sometimes a lens can be made compatible by the manufacturer, sometimes not. There is also the risk of a problem that results in the lens and body manufacturers directing blame at each other. 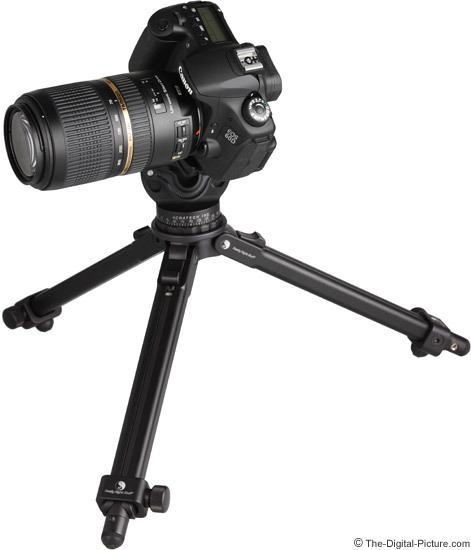 Tamron USA's 6-year warranty far surpasses Canon USA's standard 1 year warranty. 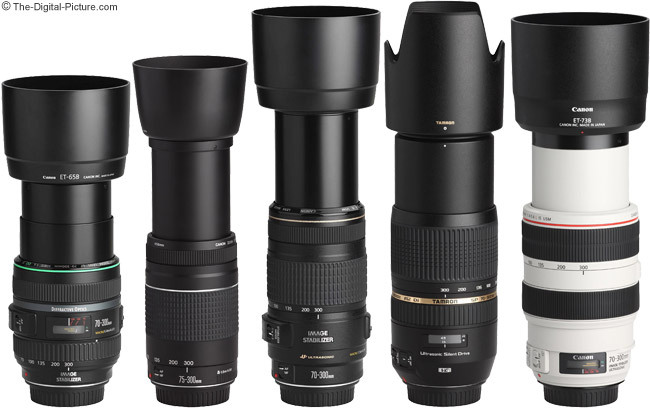 There are many 70-300mm (or similar) lenses available. What sets the Tamron apart from the rest is its combination of good image quality (avoid 300mm), nice physical features and vibration compensation for a value price.